It was all contained in this cute tin box by Moda, which is perfect for storing notions. This matching cut of fabric has a sewing theme, with pincushions, scissors, and irons scattered about. I'm thinking it'll be perfect for a SM cover. 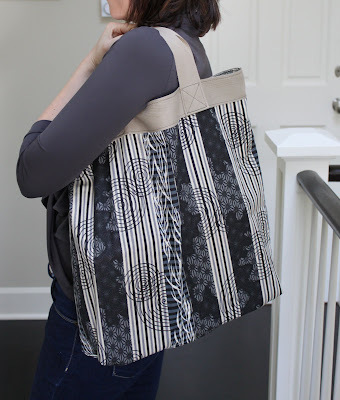 Also included were materials and instructions for making this tote bag. This is perfect for me because I'm a total "bag lady" - I have reusable bags stashed everywhere. All of it's from my favorite store in Berkeley, CA - Stonemountain and Daughter! That "is" a very nice gift....such a cute tin box and the bag looks great. Great gift, great bag, and Happy Belated Birthday! Happy Birthday! What a thoughtful gift. You are a very lucky sewer! My MIL has traveled all over the world and all we ever got were really ugly gifts. I think she must be color blind sometimes. Nothing she bought ever matched our home, and the fabrics she bought me were really pretty dreadful! I know, sour grapes, but she really does have dreadful taste. Your mil on the other hand, has great taste! That's a great bag - cool pressie! What sweet and thoughtful gifts! Happy birthday! You lucky girl! How gorgeous are these fabrics... and a matching tin. Now that really is a gift for a seamstress. It is such a very beautiful bag. I hope to have same. LOL!!! Anyway, belated happy birthday!!! What a sweet gift! Everything is so cute. She got that at stonemountain?? It's unbelievably adorable. I will have to look for it next time I go. Aren't you lucky to have such a nice MIL.I love it all! I love that little suitcase. The fabric IS perfect for a sewing machine cover - that's exactly what I used (well, I used a charm pack and pieced it together) to make mine, and it never fails to put a smile on my face when I see it. Love the bag too. :) Happy belated Birthday! That's a very cool gift!